We are so naturally blessed with eyes to see that many people neglect its importance. Many of us are doing things that impair eyes seriously without consciousness. From now on, learn some tips to avoid bad habits and protect eyes. 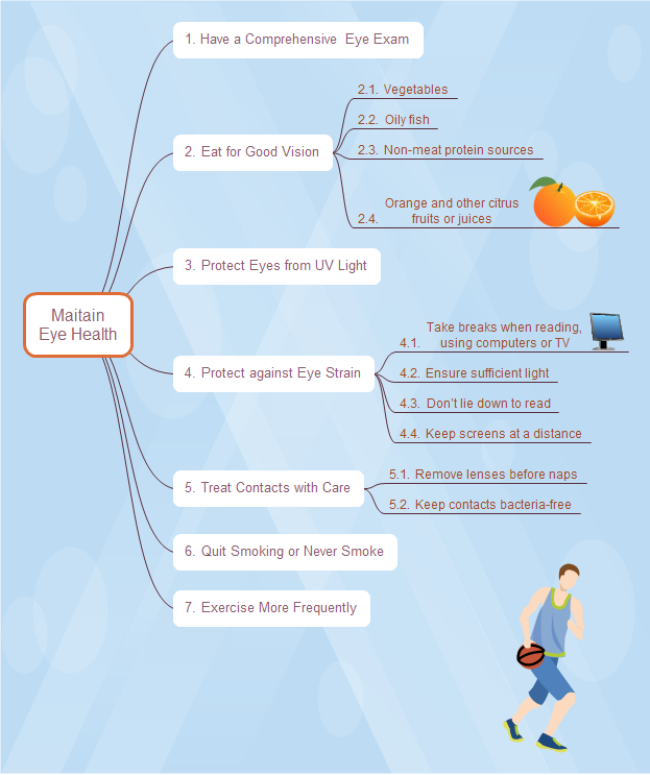 Simply speaking, these tips should be paid attention to for the sake of eye health. A mind map drawn with Edraw, showing tips for eye protection. You can also create such beautiful mind maps. Try Edraw for free. You might think that your vision is fine or that your eyes are healthy, but having a comprehensive dilated eye exam is the only way to be sure. Many common eye diseases such as glaucoma, diabetic eye disease and age-related macular degeneration often have no warning signs. Detecting eyes diseases in their early stages helps to better cure them. What is more, an ounce of precaution is worth a pound of cure. We had better protect our eyes in daily life to prevent eye diseases. Hundreds of bacteria from your mouth will be introduced directly to eyes, which could cause a serious infection. The food on your plate is crucial for eye protection. Nutrients such as omega-3 fatty acids, lutein, zinc, and vitamins C and E might help ward off age-related vision problems such as macular degeneration and cataracts. Regular consumption of these foods can help maintain good eye health. Green, leafy vegetables such as broccoli, spinach, wolfberry leaf, and collards. Salmon, tuna, and other oily fish. Eggs, nuts, beans, and other non-meat protein sources. To learn more about healthy diet, read this article: : How to Eat Healthily. You can also learn benefits of fruits and benefits of vegetables. Eating a well-balanced diet also helps you maintain a healthy weight, which decreases possibility of obesity-related diseases such as type 2 diabetes. Diabetes is the leading cause of blindness in adults. If you want to share more ideas about health in a presentation, you can refer to this presentation example about healthy lifestyle. You should always wear sunglasses with proper UV protection to shield your eyes from the sun's harmful ultraviolet rays. This can help reduce your risk of cataracts and other eye damage. Computers, TV and cell phones all pose great danger to our eyes. Taking breaks regularly when using computer or watching TV. Try to take a 15-minute break away from your computer or TV every two hours, and rest your eyes every twenty minutes by looking around, blinking/closing eyes or doing eye exercises. Ensure sufficient light to read and write, work on the computer or watch TV. In low light or dark, eyes have to work harder than usual, causing strain. Don't lie down to read. And remember to keep screens at a distance. Remove lenses even before naps and give your eyes a break by wearing glasses once a week. And to keep your contacts and their case bacteria-free, wash your hands before handling them and replace contacts as frequently as prescribed. Smokers are more likely to get cataracts, optic nerve damage, and macular degeneration. According some studies, regular exercise - such as walking - can reduce the risk of age-related macular degeneration by up to 70 percent. Eyes are among the most vulnerable parts of our body, and they need careful protection to maintain and improve eyesight. Follow the above tips and share with your friends and families. 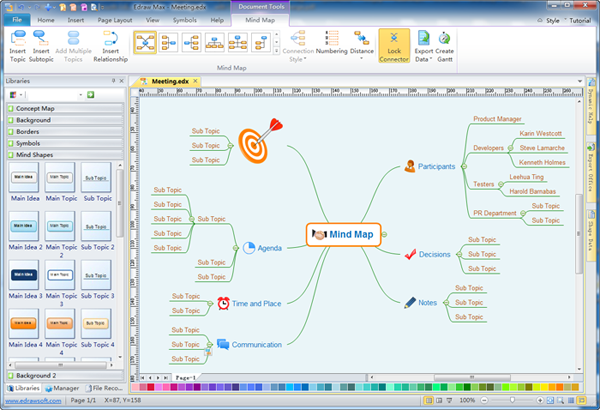 Edraw Mind Map is a free mind map maker with inbuilt templates and examples which are very easy to use. You can easily conceptualize your visualization on computer and organize your work by using this maker. It comes with various embedded features like smart drawing guide which makes mind mapping quite simple; supporting big size and multiple page mind maps; preset themes, effects, styles; automatic alignment, compatibility with MS office and PDF, being easy to share and much more. You can also insert notes, attachment and hyperlink.